I'm baaack!!! And I am now married... craziness! :) I will have tons of food photos from my honeymoon to Greece posted soon, but first I have another Dorie entry to post... and can I please tell you how happy I was to have a nice, easy recipe to get back into TWD! ;) These Granola Grabbers were delicious and only took me an hour to make. So thank you, Michelle of Bad Girl Baking, for choosing this awesome recipe. The recipe called for a lot of added nuts and raisins, but since Adam hates nuts and I'm not crazy about raisins, I used dried cranberries and white chocolate chunks instead of the other add-ins. I also substituted honey for the white sugar to make sure they were soft. The granola we got was from Whole Foods and it already had some sunflower seeds in it, so that gave it a bit of a nutty flavor. The batter came together quickly and easily. I halved the recipe (40 cookies seemed a few too many), so the only annoying thing was halving the egg, but I just beat the egg a little bit and weighed out half before adding it in. I love using these dishers! I used a #40 disher for these and it turned out to be exactly the right size. I dished 'em all out onto the silpat and then packed them tight with my hands, as Dorie suggests. They definitely turned out great! The texture was delicious and they stayed soft after they cooled... and I had to practice some restraint to stop eating them all. I highly recommend the cranberry/white chocolate substitution! 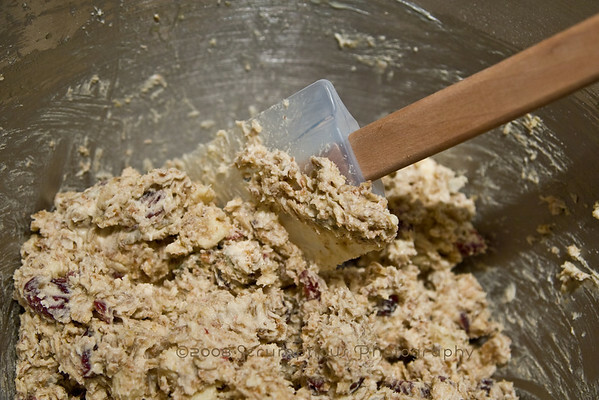 Be sure to check out all of the other TWD blogs for their Grabbers, and look for the recipe on Michelle's blog! welcome back mrs. kim! these cookies look great with the white chocolate, and like that honey substitution. nice photos of the cookies spilling from the jar! Hey there little newlywed! Yay! Welcome back! Love your variation and of course your scrumptious pics! Congrats on your new marriage! Your blot is aptly names! Awesome photography! congratulations, and welcome back! honey sounds like a wonderful alternative. noted in my cookbook, for next time! Yummy! I did cranberries too, but the white chocolate sounds like a great addition. congrats on your wedding as well! I love how you added those white chocolate chunks! Your pictures are amazing. Kudos to you for still participating in this week's TWD, despite the busyness!! 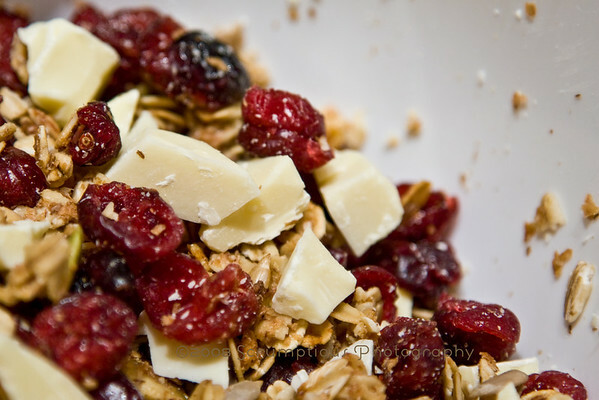 The granola looks fabulous. Welcome back! I'm amazed that you're already back into it so soon after getting married, but I'm glad too - those look amazing, and I love the sub of honey in place of sugar. Great idea. Good to see you back, your beautiful photography was missed! 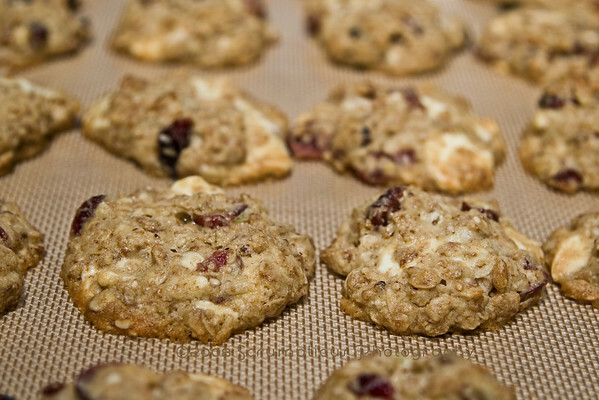 The cookies sound delicious with white chocolate and cranberries, nicely done. Congratulations on your marriage!!! How exciting! Enjoy this time...there's nothing like being a newlywed!! These look great - I love the cranberries and white chocolate idea! Love that jar picture, too! So cute!! omg married!?! CONGRATULATIONS! I totally agree with white chocolate and craisins! I definitely wanna do that next time. Love your pictures as always. PS. What camera do you use? Being a profesh I am sure its beyond my means but I am curious. I wonder if I could convince my hubs that I need a mega swank camera to take my food pictures. LOL. Welcome back and Congratulations. Looking forward to seeing the pics from Greece. This recipe is great - I love your variation as that is what I would do as well - This is a must try! welcome back!!! congratulations! and what a nice recipe to share with your hubby! as always, great photos. Welcome back! I am going add honey in next time. Your pics and cookies are beautiful! Married. Wow. Just Married. I can't even remember that far back...but I do know that it just gets better and better and better, so congratulations! Your cookies are amazing...love the combination, thanks for sharing. Photos are, as always, out of this world. Always fun to visit. congrats on the wedding!!! your pictures are so gorgeous. I totally should have gone down the "cranberry and white chocolate" route. Oh, married woman baking cookies-what could be more wonderful? I'm dying to see your Greece pics, especially since you took them. I can't believe that I've already made these cookies twice last week and now want more. @cb - i have the canon 30d... i really think that a digital SLR is the way to go, but it can definitely be expensive! the canon rebel, XS or XSi, is i think around $650 right now... sooo... yea. the next step down is the canon G9 which is around $500. anyway, i think lighting is much more important than the camera you use... if you can get good natural light from a window or use an off camera light source, you can get great pics with a point and shoot camera. i am kind of an addict of strobist lighting blog! also - if you definitely want to upgrade cameras, check out dpreview first! Congratulations and welcome back, newlywed! Gorgeous photos and I'm sure your honeymoon pics are gorgeous as well! A couple of bloggers have added white chocolate... I wish I had thought of that, it sounds perfect. OMG, I am such a big fan of your blog. Awesome pics and awesome blog. WOW! Anyway . . good job on the cookies! Makes me want to climb inside the screen and eat one. Congratulations! I love your photos. So simple, yet very warming. Great job on getting all the nooks and crannies. 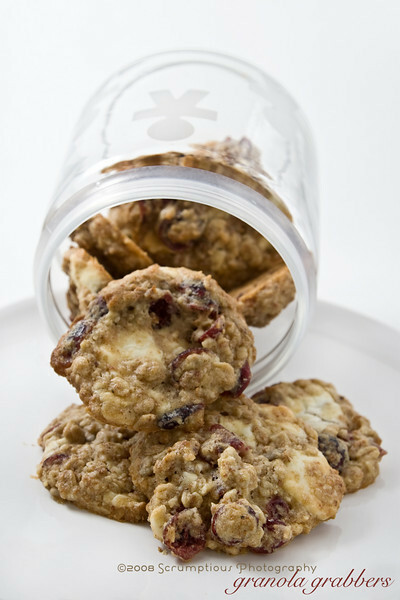 Your cookies look fab - good combo of white choc and cranberries. Best wishes for married life! welcome back! can't wait to hear about greece! 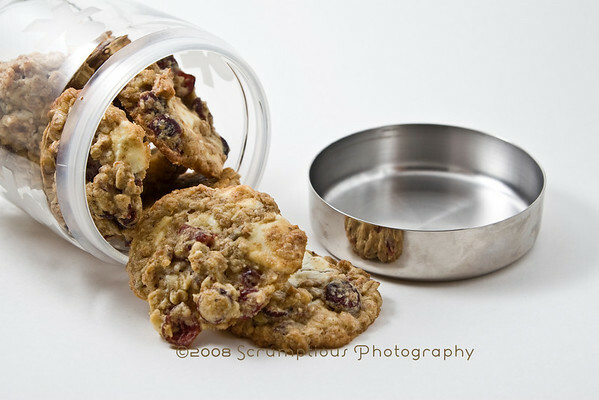 i love, love, love dried cranberries and white chocolate, and i'm sure your cookies tasted divine! And these cookies look fantastic, too, Kim! Mazel tov! And your cookies look fabulous! Congrats - hope you have years of bliss and happiness. Lovely cookies! Congratulations on your marriage! Your honeymoon destination sounds beautiful, that's for sure. Your cookies look marvelous. What an amazing honeymoon you had! And the photos!! Your granola grabbers look delicious too. I love how they're spilling out of the canister! @danielle, i think you posted anonymously, i tried to email you but i didn't know your address either ;) anyway, my lighting depends on the shot i am doing. for the cooking shots, i just use regular house/incandescent lights, but since i shoot in RAW format, i can correct the color temperature later on the computer. if you're shooting in JPEGs, you need to set your camera to the tungsten white balance setting to try to get rid of the yellow. for shots like the "studio" type ones, i use a flash, which is already daylight-temperature (not yellow). 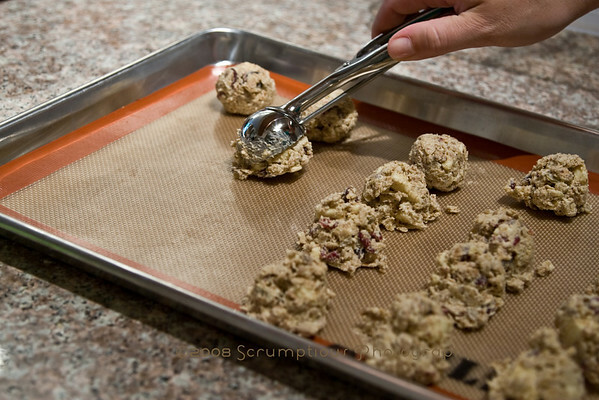 I can't wait to try these Granola Grabbers! They look and sound so delicious.